There are few experiences like riding an ATV through the jungles and along the white sand beaches of Cancun, Playa del Carmen and the Riviera Maya. Feel the power beneath you as you race along the shores of the beautiful Caribbean Sea. These ATV Tours include such great experiences as swimming in cenotes, flying high on exciting zip lines, and driving your own speedboats! BEST SELECTION & LOWEST PRICES ON CANCUN ATV TOURS! 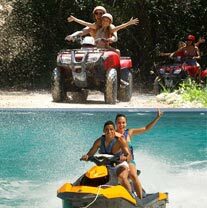 Cancun ATV Tours are among the most popular tours in Cancun. We also offer Cozumel ATV Tours as well. A: This varies depending on the tour. Please refer to the tour detail pages for this information. Kids below 16 years old aren't able to drive any of the ATVs, though they can ride as a passenger. A: ATVs are split between semi-automatic and fully automatic, depending on the tour you choose. Refer to the tour detail page. However, even semi-automatic shifting is quite easy - even for beginners. Q: Which one would you recommend? A: Anything that involves Selvatica...but we wouldn't sell it if we didn't think you'd enjoy it. They're all fun, it mostly depends on your interests. Q: Which ATV tour is located closest to my hotel? A: All the above ATV tours take place in the area of Puerto Morelos/Playa Paraiso, about 30 minutes south of Cancun. There is no appreciable difference as far as travel time. There is nowhere to ride ATVs in Cancun, so you will have to drive to the Riviera Maya to do your ATV tour.